The timing for the preparation time is over two hours. Along with cookingtime 10-30 minutes and this recipe will make about twelve buns. For the buns, sieve the flour, salt and ground mixed spice into alarge mixing bowl, then rub in the butter using your fingertips. Make a well inthe centre of the mixture, and then add the sugar and lemon zest and yeast. Beat the egg and add to the flour with the tepid milk. 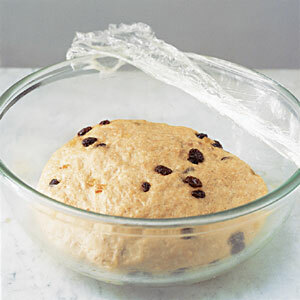 Mixtogether to a form a soft, pliable dough. Turn out the dough onto a lightlyfloured work surface. Carefully work the mixed dried fruit into the dough untilwell combined. Knead lightly for 5 minutes, or until smooth and elastic. Greasea large, warm mixing bowl with butter. Shape the dough into a ball and place itinto the prepared bowl, then cover with a clean tea towel and set aside in awarm place for one hour to prove. Turnout the proved dough onto a lightly floured work surface and knock back thedough. Shape it into a ball again and return it to the bowl, then cover againwith the tea towel and set aside for a further 30 minutes to rise. Grease a baking tray with butter and transfer the buns to thetray. Wrap the tray with the buns on it loosely in greaseproof paper, thenplace inside a large polythene bag. Tie the end of the bag tightly so that noair can get in and set aside in a warm place for a further 40 minutes to rise. Preheat the oven to 240C/475F/Gas 8. Meanwhile, for the topping, mix the plain flour to a smooth pastewith 2 tablespoons of cold water. Whenthe buns have risen, remove the polythene bag and the greaseproof paper. 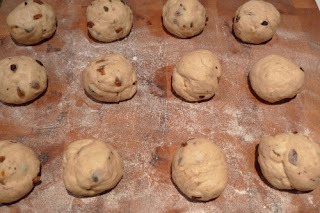 Spoonthe flour mixture into a piping bag and pipe a cross on each bun.